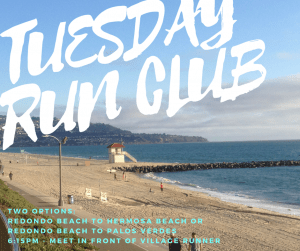 The Tuesday night groups runs between 4 to 7 miles from the store to the Hermosa Beach Pier and back but you are more than welcome to cut the run as short as you’d like or extend it as long as you’d like! The running group leaves at 6:15pm with a variety of paces and distances! Free parking in the Riviera Village after 6pm!